The Spotted Tongue: Herding insinct: She has it! Herding insinct: She has it! When we first got Dahlia, one of the things the foster home said about her was that she was a Border collie but had "None of the Border needs for high exercise nor herding behaviors." We began questioning this right away. When David and I separated on a walk, she would come around one of us and nip at our heels. When she saw the geese out in a field she wouldn't run straight at them but instead would go around the outside of the flock. We never got to see the end result of that as her racing toward a bunch of wild geese resulted in something that should surprise no one: They flew away. I posted her pictures on Border collie sites and asked if they thought she had collie in her (I fully admit I really wanted her to). Some said they thought she might; many did not believe she did. She's clearly a mutt. 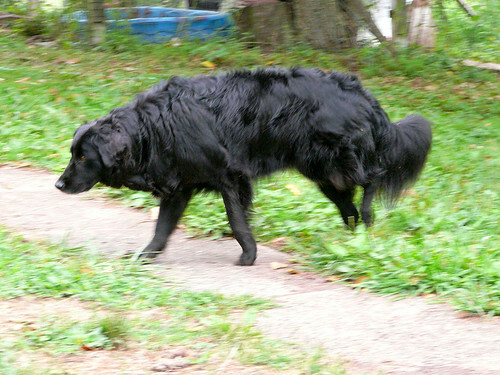 A 50 pound black furry mutt of unknown origin. It's pretty clear she has retriever in her, though she's not a dog who retrieves. But still, I was sure she had collie in her. I saw it in her face, in her coat, in her tail. And recently, I saw it as her herding instinct came out strong and clear! She met goats. This is the first time I've seen her actually come into contact with livestock. There were just two of them, but she was very interested in them from the start. Oh hi there Miss Goat. May I come in? That's right. She crawled right underneath the fence. We had to stop her from going all the way under and right into the pen! 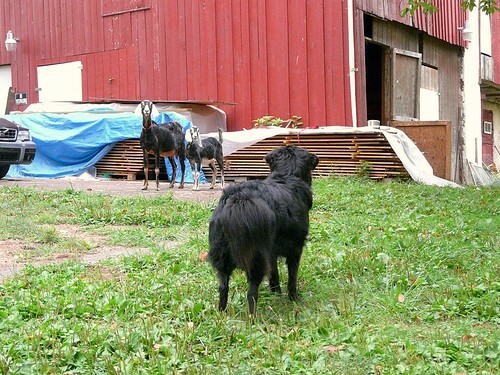 But the next day, she faced down the goats outside of the pen, with them free to move around as they wished. She was fascinated by them. 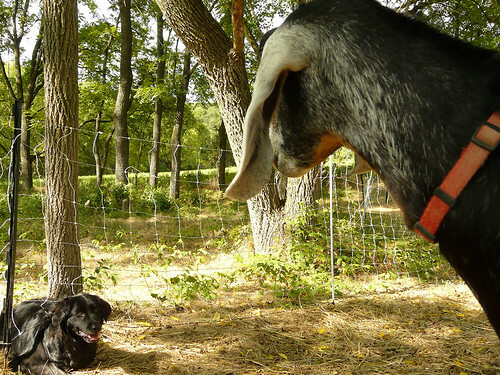 But then, all, of a sudden, it's like a light clicked on up in her doggy brain somewhere and she realized what she should be doing with those goats. What should she be doing? This! That's right folks! She gave those goats the eye and stalk posture and they began to move. Now granted, she put way too much pressure on and they ran away from her, but she went after them, cut them off, tried to get them to move, well, somewhere. I have no idea where, but it was clear she was trying to herd them somewhere. So there you have it. Dahlia is most definitely a Border collie mix and it looks like the Border collie side is much stronger than the retriever side as she has no interest in retrieving whatsoever. I wish I knew if Dahlia showed such instinct as a pup. We didn't adopt her until she was around 2 years old or so, so her early life is shrouded in mystery! When I was young we did have a border collie for a short while. I always thought the picture we had of her was her hiding in the grass. Looking at it, I'm pretty sure it was eye/stalking behavior. My parents, sadly, couldn't handle her and ended up giving her to someone in the country who lived on a farm and had goats. Bandit was no doubt much happier there! When good dogs go bad!